Our first gift to you is an intergenerational educational and worship event prepared by students Cyndi Beerbower and Robin Crawford. 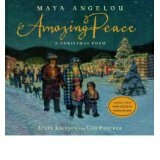 It is based on Maya Angelou’s beautiful book Amazing Peace. Click HERE to open the pdf file that contains the plans for the session. Approaching Advent by Storypath is licensed under a Creative Commons Attribution-NonCommercial 4.0 International License. I was afraid we might be just a little late for some people who were already deep into planning for Advent! Glad we got this to you in the nick of time!